This year's Sinkankas Symposium keynote, by Dr. James Harrell, is on the discovery of peridot in the region of the Red Sea. Above, Red Sea sailors have come ashore to bake bread. From Peter Bancroft's article on the Red Sea peridot mines. You have until 11:59 pm PDT today to get a discount on the symposium registration. The annual Sinkankas Symposium has been described by John Koivula as the "best gem mineral symposium in North America" and has a reputation for achieving sold-out enrollment. This year's theme focuses on green-colored gems that have lower public recognition than their more illustrious counterparts such as emerald, jade, etc., with peridot perhaps the most well-known. For instance, Pala International’s Bill Larson will offer "Green with Envy," a photographic odyssey of fine crystals and cut gems from worldwide localities featuring peridot and a panoply of uncommon green gems of beguiling beauty ranging from A (actinolite) to Z (zircon). Lisbet Thoresen, whose study of ancient garnet we reviewed in January, will discuss the disappearing act of the "poor man's emerald" in her presentation, "Chromian Chalcedony: A Gem from History's Lost and Found." Note that the speaker lineup has changed. Visit the Sinkankas Symposium website for speaker bios and abstracts of presentation topics. The Sinkankas Symposium is organized by Roger Merk, and co-sponsored by the Gemological Society of San Diego and the GIA (Gemological Institute of America). It will be held Saturday, April 5, 2014, at the GIA World Headquarters and The Robert Mouawad Campus, 5345 Armada Drive, Carlsbad, CA 92008. The registration form is now posted on the Symposium website. Or register online. Early-bird registration ends on March 18, 11:59 pm Pacific Time, when it goes from $95.00 to $105.00 per person Registration includes refreshments, boxed lunch and one copy of the printed book. Absolute deadline is April 1. No onsite registration. Use either the form/s-mail or the online registration to pre-pay for extra copies of the Peridot book and/or the revised edition of the Ruby book and get them for $30.00 each (delivered at the Symposium); at the Symposium, they will be $38.00. As she always does, our friend Eloïse Gaillou, curator of the Natural History Museum of Los Angeles, shares her favorite sights from the gem and mineral shows, and last month in Tucson was no exception. Her posts are divided in two—Gem Shows and Mineral Shows—but there is plenty of crossover, with the first image shown below appearing on the latter page. Walk in hungry. The New York Times yesterday ran a follow-up to Tucson. "On the Origins of Gems" looks at some of the trends both at Tucson and in the larger (is there a larger?) market, and issues such as rarity and locality. Amongst those quoted: Robert Weldon (GIA) on Ethiopian white opal, Richard Hughes (Lotus Gemology) on the rainbow hues of Madagascar sapphire and pigeon's blood ruby, designer Erica Courtney on a missed opportunity (Paraiba tourmaline from Brazil, too expensive at $300/ct—twenty years ago). Spinels continue to grow in popularity, keeping demand on the rise. As this awareness grows, the bounty of fancy colors opens up to a whole new group of collectors. Spinel requests are branching out from the classic red hues into green, blue-greens, blues, lavenders, pinks and beyond. These fancy colors are completely natural, coming out of the ground in this wonderful array. 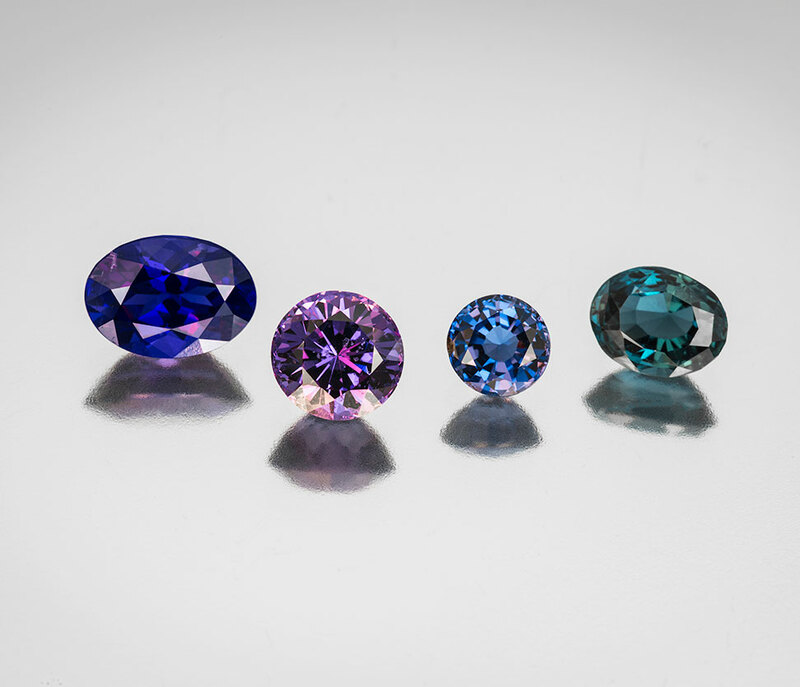 Although singularly refractive, spinels often display a pleasant mix of hues and exhibit a slightly higher dispersion than sapphire, giving them a more lively character in some cases. There are also color-change and color-shifting spinels, taking on different colors in different lighting. Supplying the demand seems to be the tricky part these days, so Pala International is continuously gobbling up all the spinels we can get our hands on. Check out our extensive collection of spinels here. Interested? Select inventory numbers above, then contact us! Gemologist and author Richard W. Hughes presented in Tucson last month on the topic of "Ruby & Sapphire: A Collector's Guide" (coincidentally the title of his new book). Pala International's Bill Larson was so impressed by the presentation's closing montage, "Lands of Red & Blue," that we asked Hughes to share it with our readers. He complied, providing us with an added treat, "Source." Industry writer Deborah Yonick provides her take, via AGTA, on the recently concluded Academy Awards. Pictured in her report are Jennifer Lawrence sporting a back-draped carved rock crystal and diamond, a green tourmaline and diamond pendant worn by Jennifer Lee, and Catherine Martin wearing a yellow diamond and amethyst arrows brooch-pendant. Martin won an Oscar for costume design for The Great Gatsby, on which she collaborated with Tiffany & Co. in jewelry design. To browse some of the jewels close-up, see the Jewels du Jour blog. Elser and Schlegel also are involved with the drilling of drinking water wells and building of sanitary latrines, with the aim of one of each per year. The wells free people from the time-consuming drudgery of having to haul water from far-away sources. The couple work in Tanzania with MSABI, a program that describes itself as "a demand-driven, replicable and expandable model for the implementation of cost-efficient community based water, sanitation and hygiene (WASH) projects." Another project that Elser and her husband work with is the Devon Foundation: "Bringing Gemology & Lapidary Education to Gem Mining Communities." The organization is directed by Nancy Schuring, Debbie Swinney, Joe Portale and Jim Fiebig. As readers of our pages are aware, one of the challenges of gem-producing countries in the global south is creating value-added products in the countries themselves rather than shipping all rough abroad. (The situation was briefly outlined in a National Geographic Onward report last fall.) The Devon Foundation began facilitating this by awarding scholarships in the lapidary arts to students in Madagascar for whom such schooling was beyond their reach. Faceter Roger Dery provides a brief introduction to the work of the school and Devon Foundation's support. Contact the foundation here. When the country's political situation changed in 2011, the foundation turned its attention to the already-existing Arusha Gemmological and Jewelry Vocational Training Center in the famous gem-producing locality of Tanzania. (See Robert Weldon's report on his visit on behalf of GIA during the 2012 the Arusha International Gem and Mineral Fair to learn how it could serve the local community with gemological education and resources.) Using Devon Foundation funds, the school is adding a new classroom. Foundation associates also donate textbooks and supplies on visits to the school. For their part, Elser and Schlegel work with another educational endeavor, Southern and East African Mineral Centre, based in Dar-Es-Salaam, which provides training in gemology and gem cutting as well as several other mineral-related courses. The trade organization Precious Stones Multi-Stakeholder Working Group, formed last April in Paris, met last month during the AGTA GemFair. According to a February 21 press release, PSMSWG is "an open, non-exclusive coalition of companies, associations, NGOs and governments sharing an interest in responsible sourcing and supply-chain due diligence for precious stones." Many in the colored gem trade, however, question the accuracy of this representation. We are told there are issues of transparency and process that trouble some participants. The group is investigating application of due diligence guidelines by entities such as the Organisation for Economic Cooperation and Development (OECD). The group's study on this issue is slated for a late spring release. Some in the trade feel that while the concept of the study is laudible, there are concerns: it is being rushed, it lacks input from some parties, and thus it may be flawed. The group has regular conference calls; contact information is available in the press release. Tune in next month, when we will cover the working group and its efforts in more depth. A Treated Stone Sold as "Black Sapphire"
In January, GIT Testing Laboratory issued a report on a parcel of gems being marketed as "black sapphire." According to "A Treated Stone Sold as 'Black Sapphire'," this type of material is found from western China to Australia. Microscopic examination with strong fiber optic light revealed dark blue coloration along healed fissures. Under shortwave ultraviolet light, the stones glowed weakly a chalky blue mostly in the healed fracture areas. Refractive index was normal for corundum. Dicroscopic examination revealed very dark to dark blue colors. Advanced analysis also was performed and it was concluded that the stones had been treated by common titanium diffusion, but with a bit of a twist. Titanium is able to penetrate only slightly; the fissures allowed it go deeper. Sixteen months ago, we pointed to a Gems & Gemology cover that featured a "luscious jumble" of a ruby specimen from Luc Yen, northern Vietnam, in the collection of Pala International's Bill Larson. We also included Will Larson's story about the acquisition of that specimen—through the eyes of a 12-year-old. Also on that cover were three faceted stones, also from northern Vietnam: a blue spinel, a red spinel and a ruby. Beautiful. But Luc Yen produces more than spinel and ruby, as the current edition of Gems & Gemologycertifies. "Update on Gemstone Mining in Luc Yen, Vietnam," by Pham Van Long, Vincent Pardieu, and Gaston Giuliani, looks at corundum and spinel, but also tourmaline, feldspar, and pargasite and humite (the latter two often being associated with spinel). The article begins with history and geology, moving on to the mining (include a chart of more than 30 mining sites) and trading. Nicely illustrated, as demonstrated by the image below. Last month we led off pointing to a report in the official New Light of Myanmar daily, that a jade boulder weighing 15 tons had been found in Hpakant, in Kachin State. It had been found on February 9. By February 20 that boulder had increased in size to 50 tons, according to The Irrawaddy. The reason for the discrepancy is that, iceberg-like, most of it was still in the ground. On the 20th, Democratic Voice of Burma (DVB) reported it was "a 37-ton slab" and that the Burmese army had moved in to secure the area. But by the 26th, DVB reported it was "nothing but a rock," according to Kachin State minister of mines, Aung Naing. This was contradicted by locals, but the minister said it would be placed on display to prove his case. Apparently during moving the boulder had cracked proving it was just an ordinary rock. Prior to its identification, Kachin News Group (via AP) quoted a man who said the Kachin Independence Organization had been offered 10% of the boulder's value. The same day as its report on the boulder, The Irrawaddy published a scathing story on jade mining in Hpakant, titled "From Jade Land to a Wasteland." One jade dealer, U Cho, likened the dynamite-blasting method employed to the collapse of the World Trade Center on September 11, 2001. A mountain can be here and gone within the space of a month, he said. Somewhat ironically, in a section of the article titled "The wages of peace," it's pointed out that such extraction didn't begin in earnest until the rebel Kachin Independence Organization signed a ceasefire agreement with the military junta. Many people question why Myanmar remains poor despite its wealth of resources. If ever there was a good example to illustrate the answer, it is the tangled financial dealings behind the reconstruction of the Hpakant-Moegaung road. Meanwhile, Burma's jewelers have made their own demands on the government. Tired of selling only to Burma residents and foreigners who attend the periodic gem emporiums, the jewelers want to open the market, according to a March 10 Myanmar Times story. Their challenge is the same as that faced by Tanzanian crafters (see above): visiting dealers buy rough, which they carry back to the home country, leaving the local value-added producers out of the loop. In welcome news to jewelery dealers, Burma's parliament revised the 2014–15 tax law, halving the commercial tax on finished jade and gemstones, from 30% to 15%, according to a story in yesterday's Myanmar Times. The tax on rough remains at 30%. Somewhat contraditorily, March 11 coverage of tax reform by The Irrawaddy stated, "Burma’s rich natural resources, such as jade, gems and timber, have mostly flowed out of the country unregulated and lightly taxed during past decades of military rule, generating little in the way of government revenues." But a related DVB story stated that country's Internal Revenue Department issued a list of over 10,000 Burma companies that have evaded tax since 2012. In statistics that appear to match those we noted last month, Eleven Media Group reported yesterday that exports of jade for the first nine months of Burma's 2013–14 fiscal year (Apr–Dec) reached $920 million. This tops the total for the entire 2012–13 fiscal year, of $297 million. Eleven Media Group: Portrait of Shan State; "a rainbow of hilltribes, precious stones, and sacred traditions"
Volume 3 of Exotic Gems begins, in Chapter 1, "Exotic Gems," by answering a question the savvy gem enthusiast might raise: What's so exotic about tourmaline? Answer: The Dowager Empress Tzu-Hsi, who may be remembered as having installed China's last Emperor while on her deathbed. To gemstone lovers she's remembered for her passion for pink (also pearls and jade). Tourmaline, Newman informs us, was to the Dowager Empress truly exotic, because there was no local source for the material. It was her ardor for rosy tourmaline that drove a mining boom in San Diego in the years before her death in 1908. As Newman points out, the exotic isn't only the distant and alien. "Strikingly, excitingly or mysteriously different or unusual" gems, like multicolored and Paraiba tourmaline also fit the bill. Newman goes on to describe briefly the characteristics of each of the gemstones to which she devotes single or multiple chapters. For instance tourmaline, in all its diversification, is discussed across seven chapters. Chapter 2 is devoted to pricing vis-à-vis not just the Four C's (color, clarity, cut, carat weight) but also transparency (distinct from clarity); brilliance; treatments; content of copper, chromium and/or vanadium; origin; and phenomena. To illustrate cut, Newman includes the photograph by Wimon Manorotkul of a faceted quartz with a single needle of black tourmaline extending from culet to table like an axis, creating a wild kaleidoscopic effect. Chapter 3 is a general overview of tourmaline, including a brief history, beginning with a tourmaline intaglio, ca. 3rd century B.C.E., depicting Alexander the Great. (It is housed at the Ashmolean Museum, which has an online exhibition of intaglios in other materials. Exotic Gems also features examples of modern intaglios.) Tourmaline identification and chemistry are handled next, followed by the characteristics of the five tourmaline species: elbaite, dravite, uvite, schorl and liddicoatite. The reader then turns to a four-page pictorial of faceting by master cutter John Bradshaw, who also contributes an essay on cutting. The chapter ends with notes on tourmaline care. Chapter 4 covers Paraiba and other copper-bearing tourmalines, species: elbaite, beginning with a history of the Brazilian locality that gave its name—grudgingly—to material that hails from Brazil to Nigeria to Mozambique. Newman succinctly reviews the name-game issues, including "a lack of consensus" regarding issues of appearance in material from disparate localities. (Also included at the chapter's end are alternate monikers for this material—a slew of them: Caribbean-blue, electric green, neon, Seafoam, sky-blue, swimming-pool blue, turquoise blue, and even Windex-blue, a term often applied to blue topaz.) Newman then looks at identification of this cuprian tourmaline, followed by price factors. We should note here that this chapter (like the others) is abundantly illustrated. A favorite from this chapter is a necklace incorporating both African and Brazilian copper-bearing tourmaline. Chapter 5 looks at blue to green tourmaline. The blue variety, called indicolite, is explained, followed by green, or chrome, tourmaline. Just to keep you on your toes, another green tourmaline is thrown into the mix: verdelite, or tourmaline that is green, but not due to chromium, copper or vanadium. Blue-green and gray tourmaline are discussed next, with the chapter being rounded out by identification issues. Pink and red tourmaline, aka rubellite, are examined in Chapter 6, and if you needed proof that the Empress Dowager was onto something, look no further than the handsome ring pictured above. Evaluation tips and sources are discussed after a general overview. Chapter 7 deals with yellow, orange and brown tourmaline. Illustrated are stones in hues of canary yellow, lemon yellow, yellow green, golden and pleochroic orange, and salmon. Yum. Multicolored tourmaline is the subject of Chapter 8. The geologic origins are discussed before looking at liddicoatite (a variety with pronounced color zoning), effect of zoning on price, pleochroic multicolor (!) effect, and a gallery of jewelry employing this material. Chapter 9 covers cat's-eye and color-change tourmaline. Whew! Did you think we forgot the other Exotic Gems? Blue chalcedony is next, in Chapter 10, and we're reminded to compare and contrast the subtleties of this stone with Pantone's color of the year, Radiant Orchid. Let the picture below speak its thousand words. Yum yum. Newman gives this the full treatment: definition, identification, sources near and far, quality and care. Next up is fire agate in Chapter 11. This might be an acquired taste for some. As Newman writes, "If you're attracted to the color play of opal and the iridescence of ammolite," this material is for you. After an overview, Newman covers price factors, cutting and care. Two pages are devoted, again, to a master cutter's technique, courtesy Ryszard Krukowski. We love matrix opal and were delighted by the variety of examples included in the 12th and final chapter of Exotic Gems. Newman covers the five main types: boulder matrix opal, Yowah nut or Koroit nut, Andamooka matrix opal, Mexican (aka fire) opal matrix, and Honduras matrix opal. She then looks at identification traits (beware the synthetics), pricing and evaluation and, finally, care. Exotic Gems includes a three-page bibliography for further reading. You'll want to keep this handy both as a reference but also as a reminder of the variety of Planet Earth's bounty. The book can be purchased at major bookstores and jewelry supply stores, or via the link on the author’s website. With Pala Presents, we offer selections from the collection of Pala International’s Bill Larson, who will share with us some of the wealth of information in the realm of gems and gemology. And, as with this edition, gemstone-related collectibles. Bloodstone, a birthstone for March, is the third in our series of collecting cards that we'll supply over the next twelve months. For more information on birthstones, see Palagems.com. Two other collecting cards for March are available here.